In about 1913 two politicians met at the Central Café in Vienna. Discussing the likelihood of a Russian revolution one looked across the room and said, “And who’s going to lead it? – him?” The man to whom he referred was none other than Leon Trotsky, renowned at the time for idleness, but who would indeed lead a revolution that would change the course of history. At the beginning of this Holy Week we remember another unlikely looking revolutionary – a carpenter-turned-preacher from the backwater that was Nazareth. 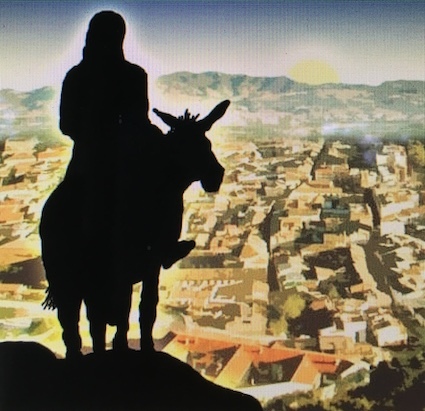 When Jesus rode into Jerusalem on a donkey on that first Palm Sunday, not many of those looking at him would have imagined that he would lead a revolution that would change the course of history. But the sceptics were wrong – both about Trotsky and about Jesus. The difference between them was that whereas Trotsky’s revolution began with a denial of God, Jesus started with the assertion that hewasGod. Perhaps this explains why the upheaval that Trotsky initiated was ultimately short-lived, but the revolution that Jesus began continues to touch and change lives around the world.